BUYSOUNDTRAX Records presents THE GOING UP OF DAVID LEV, featuring music composed and conducted by the great Jerry Goldsmith for the 1973 television film directed by James Collier and starring Brandon Cruz (THE COURTSHIP OF EDDIE’S FATHER), Topol (in his American television debut) along with Claire Bloom and Melvyn Douglas. THE GOING UP OF DAVID LEV tells the story of a ten year old boy growing up in present day Israel who goes on a journey to find out more about his father who lost his life years earlier during the fighting of the Six Day War. David (Cruz) skips school and finds a sympathetic cab driver (Topol) who drives the boy from Tel Aviv to Jerusalem, teaching him about the history of his country and helping him to discover what he needs to know about his father’s death along the way. Prepared in anticipation of the 25th anniversary of the founding of the state of Israel, producer Mildred Freed Alberg and director James Collier set out to make a film that would showcase the sights and sounds of contemporary Israel and would also be accessible to a modern television audience. To compose the music for DAVID LEV, the filmmakers sought out the services of one of the finest composers working at that time in film and television, Jerry Goldsmith. 1973 was already a busy year for Goldsmith, working on THE WALTONS, BARNABY JONES, HAWKINS and POLICE STORY, as well as another version of THE RED PONY for television. And he was also about to get married! Despite this hectic time in his life, Goldsmith took the assignment, perhaps because DAVID LEV offered the composer an opportunity he had been looking for, the chance to immerse himself in the music of his Jewish heritage. The next year, he would return to this territory with QBVII and again once more in 1981 with MASADA. For these later efforts, he would receive two Emmys. Goldsmith’s exuberant and ultimately poignant music for THE GOING UP OF DAVID LEV uses traditional folk instruments including guitar, recorder, accordion, clarinet and tambourine. 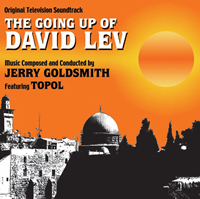 BUYSOUNDTRAX Records presents THE GOING UP OF DAVID LEV, featuring music composed and conducted by Jerry Goldsmith, is taken from mono tape (the only available source) and has been digitally edited and mastered by James Nelson at Digital Outland, with liner notes written by Jon Burlingame. Also included are two songs from the film with vocals by Topol. THE GOING UP OF DAVID LEV is a limited edition release of 2000 units.